Irish Web HQ are a professional website design company providing services to customers throughout Ireland. Website design and development, e-commerce sites and custom web programming are among the services we provide along with search engine optimization techniques to ensure a higher volume of traffic arriving at your site. Website Design Ireland has become an increasingly important issue recently as many companies seek to take advantage of the growing online market to showcase and sell their products and services. We guarantee to deliver a creative and effective website design that will enable you to broaden your market reach as you seek to grow your business throughout Ireland and beyond. 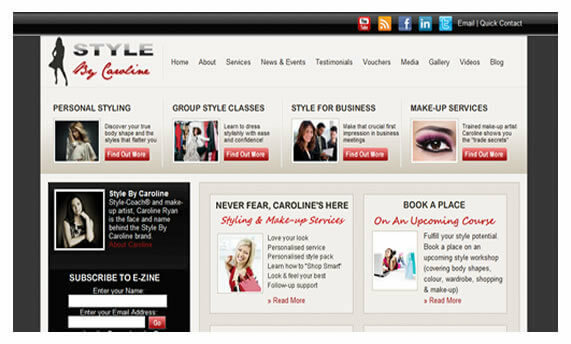 Style By Caroline is a striking example of one of our website designs. Our expertise and attention to detail led to a vibrant design to satisfy our clients requirements. This website was short-listed in the Irish Web Awards 2010 for Best Small Business Website. For your website design requirements contact us now for your free obligation quote and take the first step to expanding your business through a dynamic online presence.